Most players might just use Splatoon 2's high-flying super jump to get back into the action after you’ve respawned. Saffron Rice’s DNerd found a different use: to sink the game-winning clam. During yesterday’s Splatoon 2 tournament at Genesis 5, Saffron was down in a game of Clam Blitz that had gone into overtime. 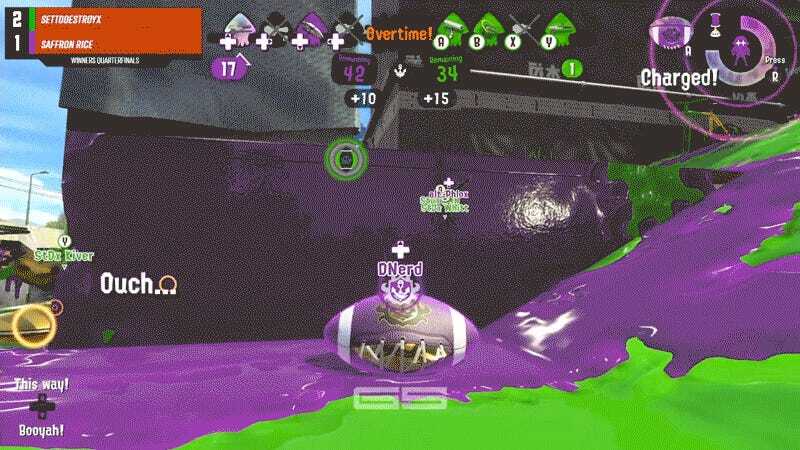 Their opponents, SetToDestroyX, were rebuffing the team’s attempts to get clams into the green goal, the objective of Clam Blitz. So DNerd picked up a power clam, found a teammate, and went for a ride. A super jump lets you zoom across the map to teammates, although you’re motionless and vulnerable while you charge it up. One of DNerd’s teammates managed to work their way close enough to the basket to set up the target, and then all DNerd had to do was hit “go” and sink the shot. At the very last second, the points registered and Saffron Rice took the round. SetToDestroyX would take the series, however, sending Saffron to the losers bracket. The former would go on to make the grand finals and win the whole tournament, while Saffron Rice fell to Deep Blues earlier in the bracket. If you want to go back and watch all the splat-action for yourself, you can find video in the EndGameTV archives on Twitch.